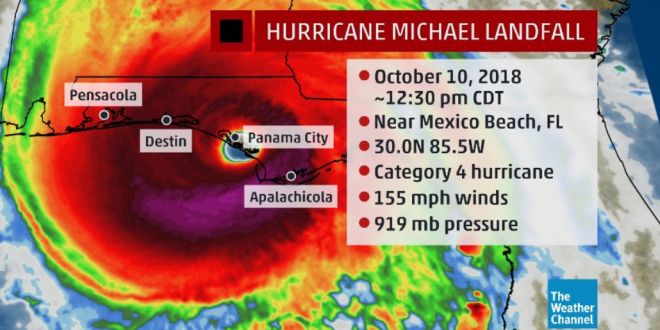 Michael Blasts Ashore Near Cat 5 With 155 MPH Winds - Joe.My.God. Supercharged by abnormally warm waters in the Gulf of Mexico, Hurricane Michael tore away tree limbs and sent pieces of buildings flying as it struck the Florida Panhandle with potentially catastrophic winds and towering storm surge. The storm made landfall near Mexico Beach as a Category 4 Hurricane with 155 mph winds, the National Hurricane Center said Wednesday. It was one of the most intense hurricanes ever to hit the U.S. mainland and the most powerful one on record to menace the Panhandle, a roughly 200-mile stretch of fishing towns, military bases and spring-break beaches.